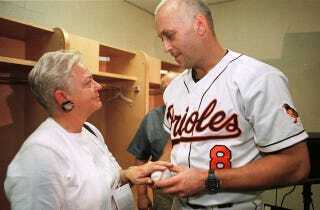 Cal Ripken Jr.'s mom may want to think about moving to a new neighborhood. On Tuesday, for the second time in as many years, Vi Ripken had a gun shoved into her face. This incident comes a little more than a year after Vi Ripken was abducted at gunpoint from her home in Aberdeen, bound and driven around in a car, and later released. A suspect has yet to be arrested in that case, and police do not believe that this latest incident is related.